Custom rubber moulded parts and bespoke designed components. Eastern Seals supplies a wide range of bespoke rubber moulded parts. We work with a select number of quality-driven factories that produce both small and large volumes from your drawing, or in some cases to sample. Our manufacturers specialise in high quality technical mouldings to tight tolerances. This ensures our custom moulded parts are supplied to the highest standards. Eastern Seals supply bespoke rubber moulded parts for many industrial and commercial applications worldwide, and to our customers’ exact requirements. Whether it is compression or injection moulded parts needed, we’re happy to quote. Moulded Rubber Seals, Moulded Grommets, and Moulded Rubber Housings. When producing bespoke rubber mouldings it is always best to work with a drawing. The reason being is that rubber does not have as tight tolerances as plastic or metal parts. This means you can never be sure if the sample is on the upper, lower or mid-range of its tolerance. The presses used for our custom mouldings are from 200 to 500 tonnes, and can produce varying sizes as required. Moulded seals are subject to changes in their geometry during vulcanization. These changes should be taken into account when designing the seal. The greater the degree of accuracy demanded, the closer the control must be during manufacture. All rubber shows some shrinkage when cooled after moulding, and allowance for this is incorporated in the mould design. The amount of shrinkage depends on the type of rubber. Moulds are made in various ways depending on the type of product and accuracy required. In compression moulding, more rubber is used than what is actually required to fill the cavity, and the excess is flashed. 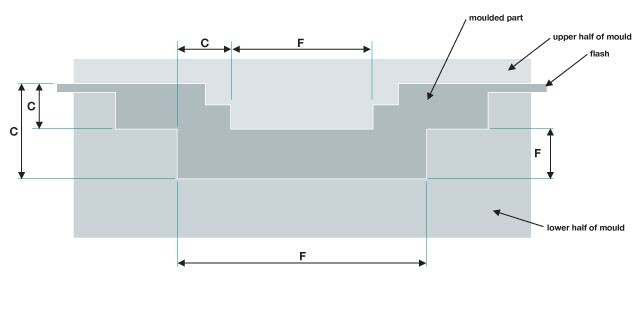 This flash can prevent the mould sections from fully closing, and can therefore affect the finished part’s dimensions. However, for injection and transfer moulding, all dimensions can be considered as fixed. Eastern Seals also supply large ID O-Rings over 700mm as moulded parts in a variety compounds including; EPDM 60-80 shore, FKM 60 – 90 shore, HNBR 60 – 90 shore, NBR 50 – 90 shore and Silicone 60-70 shore. Some of these materials are also available in FDA grades. With a proven track record, Eastern Seals can source rubber parts quickly and efficiently, with short lead times. We can turn round quotations for bespoke rubber mouldings in 24 hours for simple shapes and materials. More complex mouldings may require a little more time, but you will find the wait worthwhile. Don’t forget to follow us on Twitter and like us on Facebook for all the latest news and updates! ← Why choose Eastern Seals?